The Vassar Haiti Project promotes Haitian art and artists. Through decade-long relationships with Haitian art galleries and artists, Vassar Haiti Project serves as a ‘conduit’ for Haitian art to reach art markets in the United States. 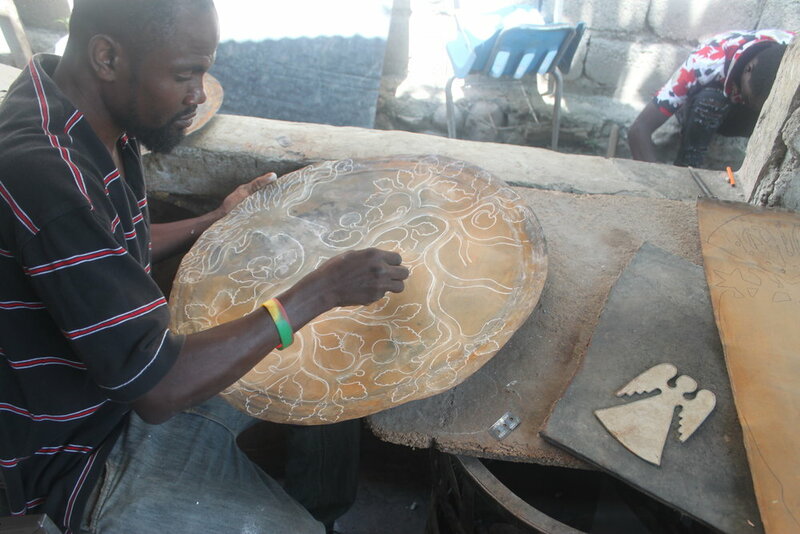 Over the last sixteen years, the Project has proven to be a steady customer, often in times of socioeconomic disturbance, ensuring patronage for our artists and galleries in Haiti. "Here in Haiti, I find even the poorest citizen happy with the little he has, capable of laughing at the foibles of the rich and at himself, and filled with 'joie de vivre.' And all of this is reflected triumphantly in their art." There is, of course, so much more to Haiti than its negative statistics and unfavorable media coverage. As Seldon Rodman, founder of Le Centre D’art, Haiti’s first art gallery discovered, there is joy. Haitian art, so imaginative and colorful, reflects the hopes and dreams of a people whose spirit soars unflinchingly above the chaos of the land. Telling the story of Haiti through fundraising art sales and outreach programs is a way to spread the joy of that country. It is also an opening to talk about the powerful economic and sociological forces that have left this little Caribbean nation devastated, destitute, and for now, devoid of tourism. At one time, dozens of galleries provided art in Haiti, Cap Haitien, Jacmel, and Port-au-Prince. Only a handful of galleries have survived the economic and political turmoil of the 1980s. The 2010 earthquake further hurt the art industry; many structures and canvases were lost or severely damaged. Today, a handful of formal galleries remain in greater Port-au-Prince. In addition, art markets can be found in every major city and wherever tourists might be expected to pass by. Through our bi-annual trips to Port au Prince, the Project makes regular visits to art markets and art galleries and buys art upfront. By doing so, the Project prevents potential abuse of artists and galleries by foreign customers. After which, the Project brings back the art and handicrafts to the United States where these products are valued more highly in the market competitively. Proceeds from the art sales go towards organizational sustainability and functions performed by our five initiatives in Chermaitre and the larger Fiervil community. Since 2001, the Vassar Haiti Project has sold over 4000 paintings, supported 200 artists, held 67 art & handcraft sales, and raised $1.4 million in revenue. It educates the public about Haiti. It provides the primary source of funding for our initiatives in Chermaitre. It helps support the art market in Haiti, thereby directly benefiting hundreds of Haitian artists and artisans and their families. Art is thus central to everything we do. People are captivated by the rich colors and bountiful imagination, and their purchases allow their money to go where it is needed. It is our hope that we can share these incredible works with the public, all the while supporting the local population of Haiti.